A smoker snuffs out a cigarette at the Capitol in Sacramento, Calif. The rule, issued Wednesday by the Department of Housing and Urban Development, prohibits smoking any lit tobacco products (like cigarettes, pipes and cigars) in indoor areas of public housing complexes. It also bans smoking in public housing administrative offices and in outdoor areas within 25 feet from the buildings. The department says the rule "will save public housing agencies $153 million every year in repairs and preventable fires, including $94 million in secondhand smoke-related health care, $43 million in renovation of smoking-permitted units, and $16 million in smoking-related fire losses." It gives public housing agencies 18 months to bring their buildings into compliance. 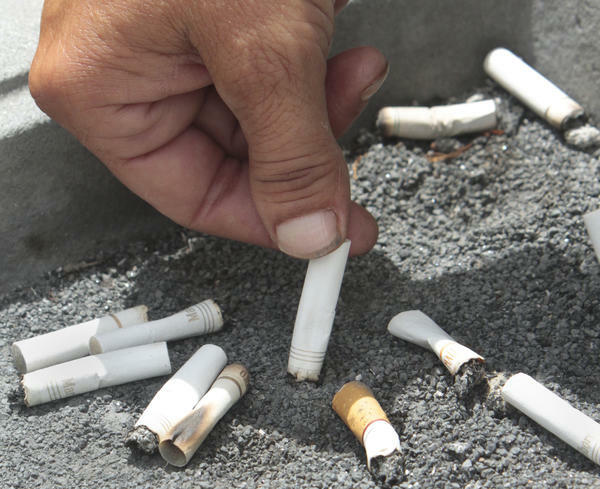 The department says it has been encouraging public housing agencies to impose smoke-free policies since 2009 and about a quarter of the units already have these rules in place. "More than two million people now live in public housing, including 760,000 children," as NPR's Pam Fessler told our Newscast unit. "Every child deserves to grow up in a safe, healthy home free from harmful second-hand cigarette smoke," said Housing and Urban Development Secretary Julián Castro said in a statement. "HUD's smoke-free rule is a reflection of our commitment to using housing as a platform to create healthy communities. By working collaboratively with public housing agencies, HUD's rule will create healthier homes for all of our families and prevent devastating and costly smoking-related fires." The new prohibition on smoking "will have the biggest implications in New York," The New York Times reports, where the nation's largest public housing agency "has lagged behind many of its smaller counterparts in adopting smoke-free policies." Questions remain about how the ban will be enforced. HUD said in the rule that it was leaving it up to individual public housing authorities to use "lease enforcement actions" to make sure tenants don't smoke in the buildings, and suggested "a graduated enforcement approach that includes escalating warnings with documentation to the tenant file." However, those decisions will remain at the discretion of each public housing authority. "The last thing that we want are evictions," Castro told reporters, according to the Times. "We don't see this as a policy that is meant to end in a whole lot of evictions. We're confident that public housing authority staff can work with residents so that that can be avoided." The rule does not ban electronic cigarettes, but does allow individual public housing authorities to prohibit them at their discretion. It's unclear what kind of action the incoming Trump administration will take on this issue. As Pam reports, "the next administration could overturn it, but ... Castro said he was confident the rule will remain because of the proven health benefits."